Back Cover Text: Lex Luthor has discovered a way to destroy the city of Metropolis. He plans to bring Metropolis to its knees. Can Superman save the city he loves or will Lex finally have his day? "Earthquake in Metropolis" is part of the official movie book series for Children. Also at 32 pages, this book, like its counterpart "Coming Home" is made up of stills taken from "Superman Returns", with a few sentences of text telling the story per page. Story - 3: The difference with this book, is that it uses the images to tell a totally different version of events than that seen in the movie. In simplistic terms (as it's meant for young children), the story tells how Lex plans to destroy Metropolis as a means to discover what the Kryptonian crystal he's stolen from Superman's Fortress of Solitude can do. Lex's plot isn't very clear, his main goal is to learn about the crystal, with Metropolis' destruction as a byproduct of his experiment. He says he doesn't care if Metropolis is destroyed in the process and even tells Kitty, "As for Metropolis, who cares? Maybe Superman will save the city. It's not my problem." 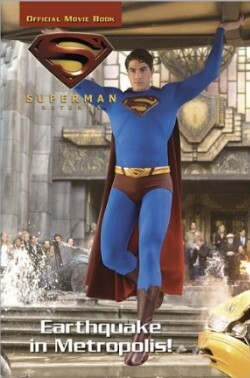 But later, when Superman does save the city Lex complains, "Ooh, that Superman! I will get him one of these days." Photos - 4: The images used in the book are great. There are even some not seen in the actual movie (such as a close-up of Lex and his crew walking towards the Fortress of Solitude, Superman coming out of the janitor's room in his Superman costume, and Perry talk to Superman after he's caught the falling Daily Planet globe). The only down point of the images, is that some of the pictures used don't really match the story being told at some stages of the book.